Before my child was born, people were already curious about his race. I was single and pregnant, and a few people asked me what race the father was. I found it so strange and kind of laughed it off at the time, but I now know those moments were only scratching the surface of the racial awakening that is being a white mother tasked with the huge privilege of raising a child of color. Where the rubber really hit the road with our family was when my child was about two years old. It was then we had our first experience in which someone showed actual fear of his blackness. It was a huge slap in the face and a major wake-up call. That a tiny two-year-old could scare someone . . . it simply blew my mind. For us, it was the first taste of the preschool-to-prison pipeline that so very many children are forced to face. We have now had the unfortunate experience of leaving two preschools run by seemingly well-meaning white people. And I’m no longer surprised that neither worked out. To be surprised would be to deny that this sort of thing happens to children of color all the time in the United States. Instead of agonizing over how unfair our world can be and starting a search for yet another new preschool, I talked with my nearly four-year-old, and we decided to start our own school. So far, it has turned out to be a truly beautiful decision, and I think we both feel empowered by building what is right for us and for so many other families in our community. Your journey may be different than ours, but I wanted to share some resources and ideas that have helped my family in my child’s early years of forming his racial identity. They by no means comprise an all-inclusive list on race—but are just some good places to start poking around. 1. Understand the experiences of people of color in this country. Check out the PBS documentary series Eyes on the Prize or the new film 13th. Read up on women of the Black Panther Party, or check out what the Radical Monarchs are up to. There is a lot to know about your particular child’s heritage, and there are so many places to start. 2. Understand your white privilege. Most people are familiar with the famous article “Unpacking the Invisible Knapsack,” and there are so many other voices chiming in to call out the white-supremacist world we are living in. 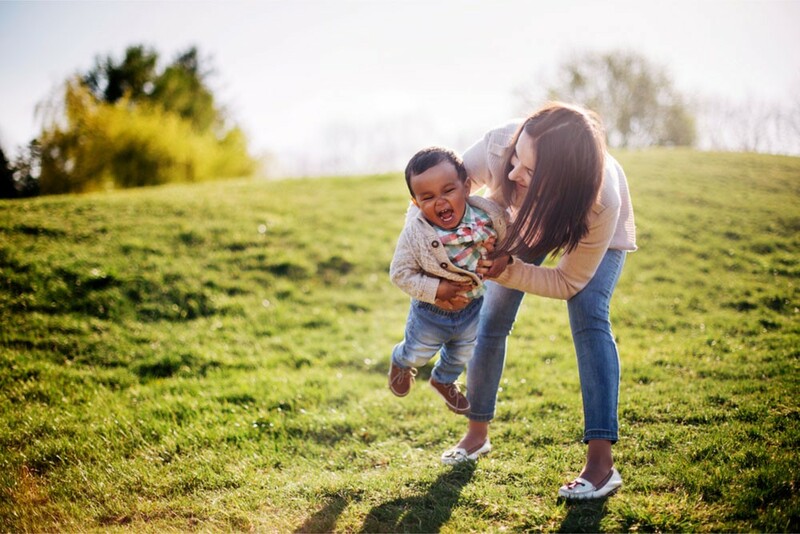 I recently stumbled on a list of lessons from a white mama of black children and a poem about how raising a son of color is different from raising a white child. The more you learn about this unearned privilege, the more you will see it playing out in daily life—and the more prepared you are to stand up for fair treatment. 3. Plug in to racial-justice movements. What came most naturally to my family was showing up to protests and similar events. This was nothing new to me prebaby; but now there was a baby strapped to my back, and I’d had that maybe well-meaning sense of “colorblindness” stripped from my eyes. It continues to be important to me that I show up at these events and gatherings and “vote” with my presence about what I think is important. I also ask myself, How will I explain it to my child someday if I don’t show up? 4. Continually stretch your mind. When I was pregnant, a friend gifted me a book. Nope, it wasn’t What to Expect When You Are Expecting. It was Who’s Afraid of Post-Blackness? by Touré (Atria Books, 2012). He said, “Read this, and it will blow your mind so hard your acid-washed maternity jeans will fly right off.” I will always appreciate his unwillingness to let me walk into being a parent of a black child without having read this book. 5. Join support and discussion groups. Ask questions, read firsthand accounts, be humble, listen even when it’s hard. Some great outlets I’ve found include Be the Bridge, White Noise Collective, and SURJ, or Showing Up for Racial Justice (especially the Facebook groups for all three). 6. Patiently educate your white friends and acquaintances. There will be moments with friends, or people you might not now call friends, that will make steam come out of your ears. People are going to say racist things, a lot. Trying to stay calm and be encouraging in these moments is much more effective for educating and changing minds in the long run than aggressively calling someone out and alienating the person. Suggest one article, one book, or some small thing that will move everyone forward a little bit. A good example of this patient approach is “The white flight of Derek Black,” a recent article in the Washington Post about a Jewish college student who befriended a white nationalist. 7. Learn how to talk about race with your child. Children can start to experience racism even before they are born. And at around six months old, babies notice and respond to skin color cues. To me, this means there is no pause before getting really aware about race. A great place to start learning about talking to your child about race is the race chapter of the book NurtureShock by Po Bronson and Ashley Merryman (Twelve, 2011). Both ESME’s advice on the topic and the blog Raising Race Conscious Children are helpful outlets, too, and the Bill of Rights for People of Mixed Heritage is awesome to stick on your child’s wall. 8. Know representation matters. Our family is just me and my kid—there is no coparent carrying the load of helping my son form his racial identity. It has been helpful for us to fill our lives with books, dolls, imagery, games, and songs made by and/or representing people of color. Having friends, teachers, and doctors that look like my child, who set amazing examples for him and show him how valued he is in this world is also a beautiful comfort for a white person who is parenting alone. One positive outcome of our current political climate and the increase in hate crimes is that a lot of white people are waking up—people who maybe thought they were already awake. Hopefully, more white Americans now understand that true tolerance is giving to every human being every right that you claim for yourself.